When I was speaking at a conference in England, I was engaged in a conversation with a Christian brother who believes that Christians who are walking in faith shouldn’t get sick (not the topic of this article). I asked him why then, in his view, genuine Spirit-filled, Jesus-loving Christians get physically ill. He was thoughtful and responded that Paul mentioned that some have become sick because of taking communion in an unworthy manner. He asked me what I thought of that possibility. 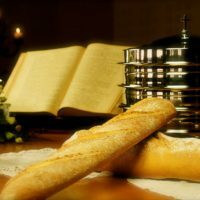 Can Christians Take Communion Unworthily? He seemed shocked. Almost as shocked as I was that I gave that answer. If I were going to exegete the topic from this text alone, I’d say eating and drinking in an unworthy manner would have to do with the disgraceful behavior of the Corinthians at the communion table (and their lack of love towards the brethren). And it may. But in the larger scheme of things, I think this passage is often applied in such a way to cause us to take a few moments and ask ourselves, before taking the bread and the cup, if we are living in a manner worthy of receiving these elements. We are often encouraged to do introspection, examine ourselves and our hearts, and see if there is any unrepentant sin in our lives that may prohibit us from taking communion. I have often done this myself. We are told to “judge ourselves” (vs. 31). But here is what always happens to me. I hold the bread and cup in my hands, and I look inside my heart and mind. I ask myself, “Have I been truly faithful to the Lord Jesus Christ and His Body? Have I loved Him and His people the way I ought?” The answer is always no. “Have I, since I last took communion, sinned in word, in thought and in action?” The answer is always yes. I then consider, should I let this bread and cup pass me by? Should I wait until I have had a perfect week: When I did not yell at my children, make a snide remark to my wife, think a lustful thought, covet someone else’s success, or wish evil on my enemies? Should I stand aside and allow all the perfect Christians to take communion without me? Then I consider: “What does communion represent?” Is it not a reminder that we are all without hope apart from the redeeming blood of our Savior? Is it not this act that constantly reminds us that the sinless Lamb of God took upon Himself the guilt and shame that we deserve? Has there ever been a week that I have partaken of the blood and body of Jesus in a worthy manner? Have I ever been worthy? If so, what did I do that made me worthy? Did I do enough good deeds to become worthy? Did I pray enough? Did I give enough to missions? Did I attend three services that week? What act or thought or deed made me righteous before a holy God? I can’t think of anything that I did, or could do, that would ever make me “worthy” of the body and blood of Jesus, broken and spilled out for me. Every time I have ever taken of the bread and the cup, I have always been unworthy. Jesus told us: “So you also, when you have done all that you were commanded, say, ‘We are unworthy servants; we have only done what was our duty’” (Luke 17:10). It is true Paul tells us to examine ourselves: “Examine yourselves, to see whether you are in the faith. Test yourselves. Or do you not realize this about yourselves, that Jesus Christ is in you?—unless indeed you fail to meet the test!” (2 Cor. 13:5). I believe Paul is saying this because there are many who sit in our pews each week who do not belong to Christ. Hence his words in 1 Corinthians 11:19 about such scenarios causing “genuine” believers to be recognized. For unbelievers to take communion, without having been washed and cleansed by Christ’s blood, would be to blaspheme the Lord’s table, and dishonor His sacrifice. If our lives are being lived for self, and if we demonstrate no fruit of obedience and repentance in our lives, we should be genuinely concerned for our very souls. Perhaps we do not belong to Christ. We should abstain from the Lord’s table until we have made this sure and certain that we have been born again. “And they sang a new song: “Worthy are You to take the scroll and open its seals, because You were slain, and by Your blood You purchased for God those from every tribe and tongue and people and nation’” (Rev. 5:9). “Worthy is the Lamb who was slain, to receive power and wealth and wisdom and might and honor and glory and blessing!” (Rev. 5:12). It is in this act of communion that I am reminded, once again, what an unworthy sinner I am, and what a perfectly worthy substitute He is on my behalf. I stand boldly before the throne of grace, not with any merit of my own, but leaning wholly on the substitutionary atonement of Christ. The realization of this makes me abhor my sin even more, not excuse it. It makes me realize how Christ deserves my obedience and faithfulness, because of the price He paid. Far from “cheap grace,” Christ’s atonement causes me to flee from sin and self and run to the only one who can rescue me from myself: Christ alone. Certainly, I repent for, and turn from, my sin. But I do so not because I am good, I do so because Christ is worthy. I partake of the cup and the bread, not because I am worthy. I am not. But because Christ is worthy, and God has declared me righteous (and therefore worthy) because of Him. I am reminded of this truth on my best weeks, and on my worst. Regardless of my actions, I am never worthy enough, and Jesus always is. From one unworthy servant to another, thank you for a thought provoking article. Truly stated, only our Savior is worthy and we are the beneficiaries of His Grace. I think the entire context relates to the paragraph above. Not considering the Lord’s body seems to tie into the idea that the Church is one bread, one body (1 Cor 10:17). Instead of being selfless like Christ, which sacrificed Himself the night He was betrayed, the Corinthians were selfish and self-focused. (One is hungry, having nothing, and another us drink, selfishly overindulgent.) The only 2 commands in 1 Cor 11:17-34 are found in 33-34. Paul’s solution to unworthy is two-fold: Wait for one another (selfless consideration of the Lord’s body), and eat at home (if one is hungry, do so, in order that we can come ready to serve the body). “Body” continues to a be used the same way a large number of times in 1 Cor. 12.